The Husqvarna PZ 60 zero-turn mower combines unrivaled power with premium cut quality and superior durability. A powerful 31-horsepower engine and 60-in. cutting width keep professional users working faster and more efficiently. Additionally, a set of cast-iron spindles provide top-of-the-line durability. This mower’s high-performance, 6-in. cutting deck is optimized to give you the perfect cut while minimizing grass clumps. 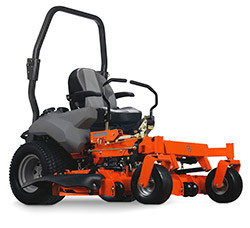 The hydro drive system and low center of gravity ensure this mower doesn’t compromise on efficiency or precision. The mower also features a practical roll over protection system (ROPS) that can be lowered when mowing in areas with low-hanging branches. For more information on the PZ 60, visit www.husqvarna.com.